Are These the New Winnipeg Jets Jerseys? Home » Hockey » Hockey Memorabilia » Are These the New Winnipeg Jets Jerseys? Much speculation, discussion and fan Photoshopping has been done as hockey enthusiasts try to figure out what the new Winnipeg Jets jerseys are going to look like when they're finally revealed. $12,000 worth of fake hockey sweaters uncovered by police in Canada might offer a hint. 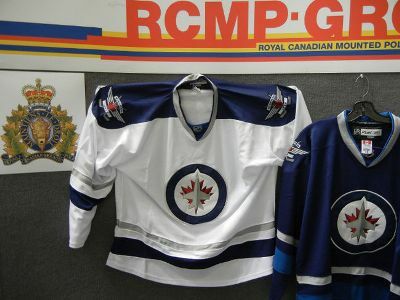 The RCMP recently announced that they had nabbed 40 fake jerseys on their way into Canada from China. Like the Rolex on the wrist of a gas jockey or the Prada purse lugged around by little Nancy down the street, the shirts have the markings and tags of what you'd expect on the real thing but there's one teeny problem: the Jets haven't officially revealed their jerseys. The bootleg jerseys carry the logo that has been revealed by the team. By all appearances, few would notice anything amiss. So, how close are the jerseys to what the real ones are going to be? It is possible, and highly likely, that the team's owners, True North Entertainment, know exactly what their jerseys are going to look like. Designs may have gone to a license holder and, despite promises of secrecy, been leaked to an overseas manufacturer. But that's all speculation until the real jerseys are finally unveiled. And with the NHL preseason set to kick off in just a few weeks, an announcement should be coming soon. Bootleg jerseys and licensed apparel have been around since licenses were first introduced. But before the Internet, it was somewhat limited to tacky tourist shops and shady sellers lingering on street corners. With eBay and online shops, counterfeiters can now hide behind a computer screen. The product they offer is very close to the real thing at a fraction of the cost. For example, if the 40 fake jerseys are estimated at $12,000, that's $300 a piece. Knock-offs can be on your doorstep for less than a third of that. It's not hard to understand why some buyers would go this route. Although it'd be wrong to support counterfeiters in any area, there's no denying their dedication. While others are making fan creations with pencils and computers, these bootleg artists are going out and actually making the hockey sweaters.